If you’re trying to use more natural health and beauty products, chances are you’re already familiar with castile soap. This vegetable-based soap has so many uses…from home cleaning solutions to gentle cleansers for your hair & skin. Many people swear by it as an all-natural shampoo, but what if your hair needs a little extra pampering? 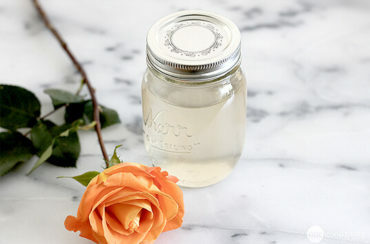 This herbal shampoo recipe, which incorporates dried herbs or flowers steeped in water, will allow you to give your hair the extra attention it needs, while still being all-natural and totally earth-friendly. You can find dozens of beneficial dried herbs and flower available for purchase, if you know where to look. You’ll find everything under the sun online at Mountain Rose Herbs, and you can usually find a pretty good selection at most health food stores. Which herbs or flowers you choose, however, is entirely based on your individual hair needs. If your hair is need a good boost of shine and luster, burdock root or elder flowers would make a great choice. For those with itchy and dry scalps, you can turn to calendula or chamomile flowers. You can also choose herbs or flowers based on your hair color (color-treated or not). For instance, dandelion and mullein are good choices for blondes, and can even add highlights to darker hair. For brunettes, try sage or black walnut. Once you’ve decided which flowers or herbs are right for your hair, here’s how to make your custom herbal shampoo. Start by bringing the cup of water to a boil in a small saucepan, and remove from heat. Place the herbs or flowers into a fine-mesh sieve, and place the sieve into the recently boiled water. Allow the herbs to steep in the water for 30 minutes, or longer if you prefer. Put the castile soap into a jar or other container. Remove the herbs from the water, and pour the herb-infused water into the container with the castile soap. Swirl or stir to combine. Transfer your herbal shampoo into a sealed bottle that’s suitable to use in the shower or bath. I used a little squeeze bottle I had lying around. Keep in mind it will seem thinner in consistency than most commercial shampoos, but I assure you the results are great! I bought homemade soap on vacation 2 weeks ago. going to use that. I color my hair. I tried all kind of shampoos and conditioners after one wash my hair color wash out.Do you have any solution for me? I have extremely oily hair and scalp, what should I use? I also make a “tea” rinse for my hair with rosemary, lavender and sage and sometimes a little coffee. I steep the leaves like a tea and then use as a final rinse, that I do not rinse out. When washing my hair I use a dime size of a botanical shampoo and coconut milk., In between both, I rise with apple cider vinegar that I do rinse out. do you have any solutions on how to make your hair grow????? It’s there anything that will help mature and thinning hair? I don’t use shampoo anymore–I’ve gone no-poo! I use vinegar and my hair looks great! It’s always shiny and curly like I like it! I have salt and peppered hair color. My hair is white on the top and mostly gray on the rest. What herbs should I use for my hair color? I make a Rosemary and Sage shampoo with the Castile for my husband. He loves it! It also is helping to make his hair darker….lol. I’ve tried to make several variations for me using the Castile as my base. but it makes my hair weighted down and oily looking. Do you have any tips or ideas of another “base” I could use that’s not quite so “oily”? Thanks Jillee! I have tried baking soda before but not faithfully. I seemed to dry my hair out too much. Go figure….my hair is strange! I will continue my quest…there has to be a happy medium in there somewhere between baking soda and castile soap! Love your site and helpful info! Please keep it up! Have a blessed day!! I too have used a “tea” of rosemary, sage and lavender as a final rinse…..it’s great so many are realizing the damage conventional hair products are doing to our locks!